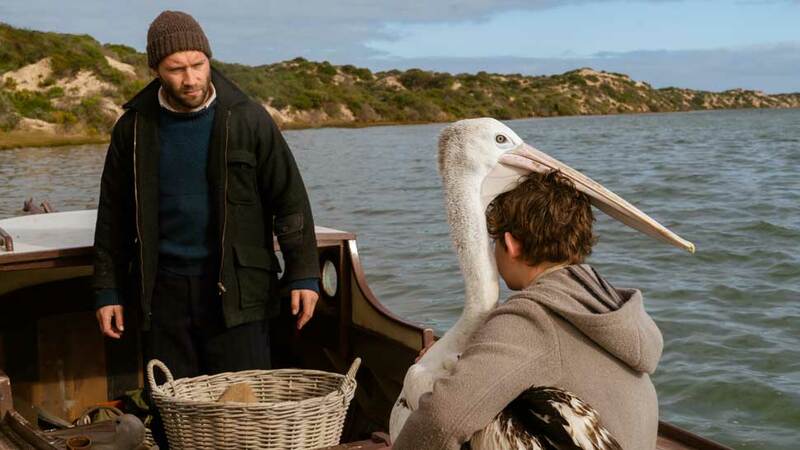 L to R: Jai Courtney and Finn Little in "Storm Boy." Courtesy of Good Deeds Entertainment. “Storm Boy” is a lovingly crafted tale that, though a little predictable, still successfully tugs at the heartstrings. Not all of it works perfectly. The filmmakers attempt to add narrative depth falls somewhat short of satisfying. But when it sticks to the core story and themes its based upon, the film shines thanks to heartfelt performances that should resonate with audiences of all ages. This adaptation of the 1963 novella by Australian writer Colin Thiele actually takes place in two time periods. In its contemporary setting, retired businessman Michael Kingley (Geoffrey Rush, “Final Portrait“) visits with his son-in-law Malcolm (Erik Thomson) and high school-aged granddaughter Madeline (Morgana Davies) while they’re in the midst of a bitter argument over a large-scale business deal Malcolm is on the verge of completing. Strangely, the fight reminds Michael of a rift he suffered with his own father decades before, one he hasn’t thought about in years. He begins to share that story with Madeline, and the film’s second narrative setting comes into focus. With help from Tom and kindly neighbor Fingerbone Bill (Trevor Jamieson), he feeds Mr. Percival and helps the hatchling survive. The bird, in turn, imprints on Michael, and they become inseparable. Their friendship proves to be the start of tremendous change for the boy and his father. It also leads to lessons that resonate with Michael into the current day, both happy and heartbreaking. 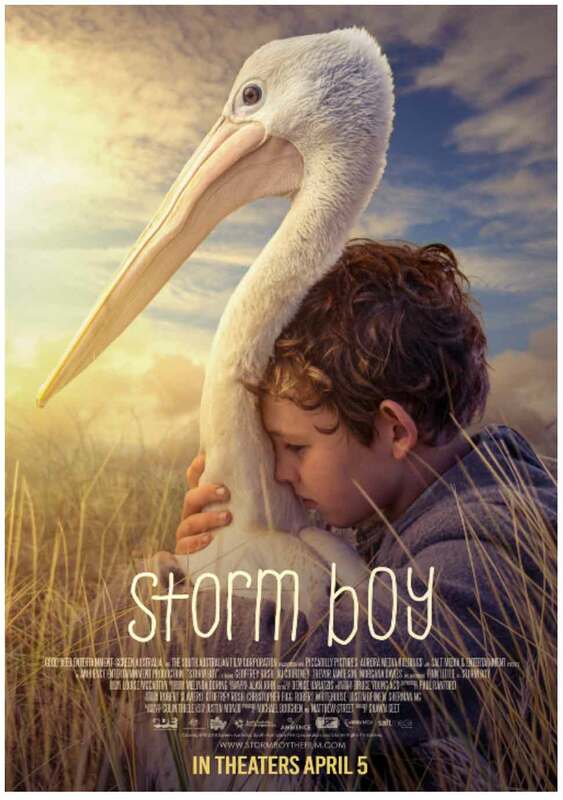 “Storm Boy” is at its best when it sticks to retelling the story that inspired it. Thanks to beautiful performances from Jai Courtney, newcomer Finn Little, and Trevor Jamieson, the film brings Thiele’s timeless story to life with charm, heart, and just the right amount of sweetness. It must be said, as well, that the many scenes Little shares with his pelican co-stars are pitch-perfect. Parents should prepare themselves. Younger viewers will want a pet pelican after they see this one. In comparison, the “modern” scenes just don’t pay off the way audiences might hope they would. They’re written and staged well, and Rush’s work is tremendous, as always, but by film’s end they feel too much like narrative devices and not enough like essential parts of the film. There’s a timeless gentility to “Storm Boy” that begs experiencing in any medium. In addition to this film, Thiele’s novella inspired a previous big screen effort in 1976 and a stage adaptation. This one may not stick the landing, so to speak, but it does so much well that it’s difficult to not recommend it as a solid, family-friendly drama. Its lessons about friendship and empathy as well as its reverence for native traditions and the natural world are ones younger audiences will hopefully take to heart, given the chance. Starring Geoffrey Rush, Jai Courtney, Trevor Jamieson, Morgana Davies, and Finn Little. Directed by Shawn Seet. Rated PG for some thematic elements, mild peril and brief language.